Antique Russian Dagestan Square Rug 03'00" x 03'06" From Esmaili Rugs Collection. Here we have an antique Russian Dagestan square rug in beautiful condition featuring the symbolic boteh motifs. The boteh resembles sprouting seed and is known as the "Seed of Life." It represents potential for growth and regeneration. 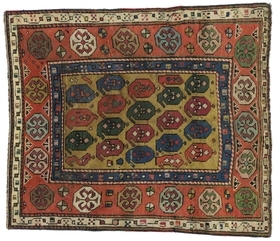 The richness of the boteh motifs make this Dagestan rug endlessly interesting. The deeply saturated palette and dramatic contrasts of salmon, blue, green and gold bring a powerful aesthetic to this well preserved antique rug from Russia. The border is equally confident in its geometric style, as it carefully surrounds the lively field of repeating boteh.